The 2013 NBA draft was not the most star-studded draft in NBA history. In retrospect, the best players to come out of it were Victor Oladipo, C.J. McCollum, Giannis Antetokounmpo, and Steven Adams. With the fourth pick of the draft, the Charlotte Bobcats selected Cody Zeller out of Indiana University. Since then, Zeller hasn’t quite lived up to producing the numbers that are expected from a top-five pick. That’s okay though–Zeller knows his role on the team and plays it well; providing tremendous hustle, decent rim protection, and some rim rattling dunks. Cody is currently having his best season as a pro; averaging nearly 11 points, a significant increase from his career average of 8 PPG. What’s impressive about this, is that Zeller basically gets zero plays called specifically for him. Cody mainly scores after initiating a pick for his teammates and rolling to the basket where the ball handler hits him for a dunk or layup. Other than that, Zeller gets his touches and buckets by fighting for 50/50 balls and offensive rebounds. This play is a perfect example of what Zeller has been doing all season, pointed out by @Nick_Sciria, Cody battles KAT for the defensive rebound, runs the floor then gets two offensive rebounds, eventually setting Kemba up for a layup. Cody Zeller can often be forgotten on the Hornets because his determination and grit isn’t as pretty as Kemba’s step-back or as smooth as Nic Batum but Zeller is still a crucial piece of the team. To show Charlotte’s appreciation for Cody, I made this video which showcases some of his best plays so far this season. The Hornets are back in action in Zeller’s home state of Indiana tonight, December 12th 2016, catch the game at 7:00. Prior to the start of the NBA season, many raised concerns about this year’s Hornets; who would fill Jeremy Lin’s spot? What would the loss of Big Al Jefferson mean? Seven games into the season and Hornet fans have pushed their worries aside and are buzzing with excitement about their team. A start of 6-1 is the best in Charlotte history and the Hornet’s aren’t looking to slow down any time soon. The team’s play has remained strong despite injuries to key role players. Jeremy Lamb hasn’t played since October 29 due to a hamstring issue. There hasn’t been much word on his return; he’s been ruled out for Friday’s game against the Raptors. The Hornet’s new big man, Roy Hibbert, has also not seen much playing time as he has been out with knee soreness. Roy should be back soon, he is expected to return against Toronto but will most likely get limited minutes. When the ex-Pacer has played, he’s made his presence known. In thethe season opener, Hibbert recorded five blocks. In the recent past, the Hornet’s have been known more for their defensive prowess than their scoring ability. That changed last year when Charlotte’s offensive firepower drastically increased. The Hornet’s are building upon that foundation and are perhaps becoming the most versatile team the franchise has seen. With the quick Kemba driving the lane and dishing it to a plethora of shooters, the Hornets can put points up quickly. Against the Pacers, Charlotte put up 75 points in the first half; tying a record that hasn’t been touched since Hornet’s announcer, Dell Curry, was still suited up in the purple and teal. This team has weapons all around on offense. It’s much more enjoyable to watch a game compared to the good ole’ Bobcat days when making a three-pointer was a rarity. In a ten year period, the team only broke into the top twenty, in terms of three-pointers made in the NBA, once. 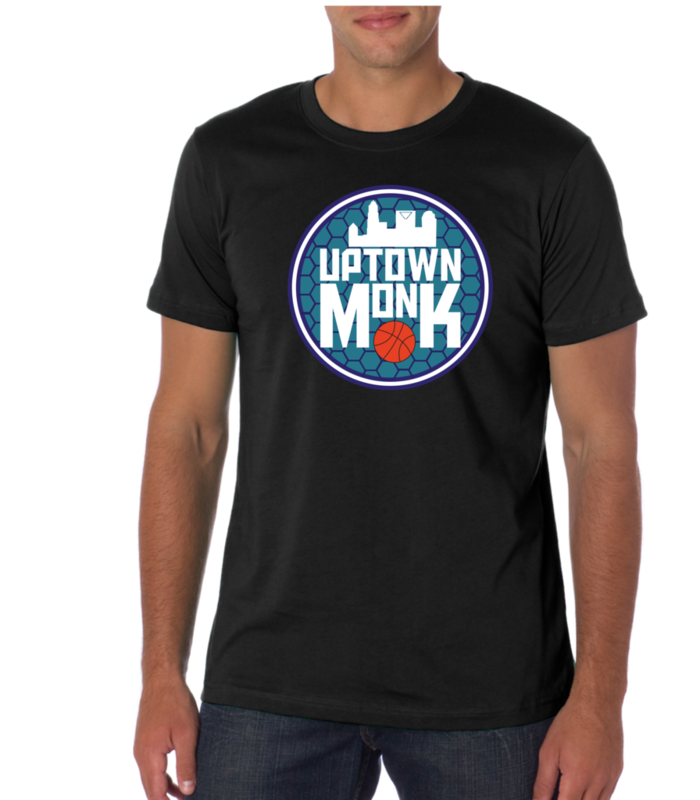 Last year, they ranked fourth in the NBA, the highest ranking of the sorts Charlotte has received since 1994. Now, it seems that just about every player on the floor can put up a good shot from deep at any time. The 3-point onslaught is currently led by Kemba Walker who is averaging three a game. The cardiac kid hasn’t just been shooting threes though, Walker’s ball handling, driving ability, and poise is the back bone of this team. Kemba has been leading his team to wins in style. The Hornets have found success because they don’t rely on one person to score. Each player has their role and plays it well. Over this winning stretch, the bench has played tremendously. Several players have stepped up to put in solid minutes when the starters are on the bench. 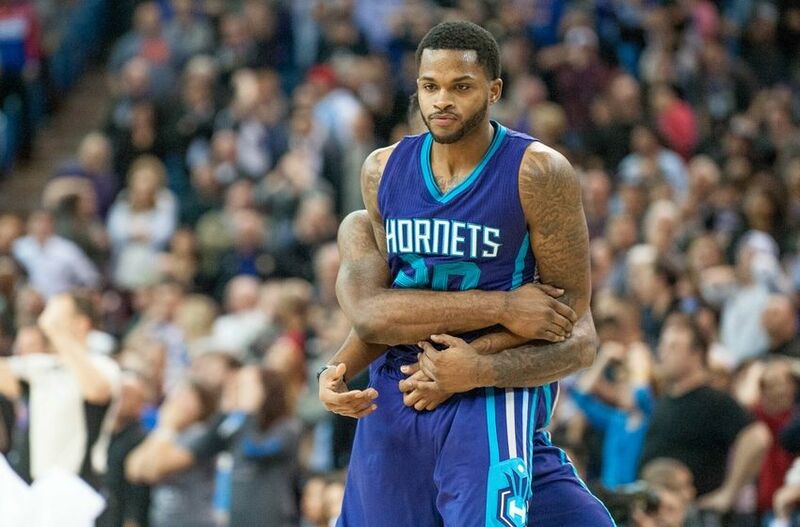 In Wednesday night’s game against the Jazz, the Hornet bench outscored their opponent’s 41-20. Frank the Tank has been averaging 11.4 points per game, an upgrade from 7.5 last year. Spencer Hawes has also been showing his worth to the team. He’s proved that he can consistently be a viable option on offense while also holding his own on defense. Hawes has put up double-digit scoring in four games so far this season, let’s hope his contributions keep coming. At first I wasn’t quite sure what to think about Marco Belinelli joining the team, but his presence is slowing growing on me. He’s better on defense than I previously thought, and is able to contribute some scoring. His ability to take and make big shots will definitely come in handy as the seasons goes on. Hopefully his chemistry with the team will also grow over the duration of the year! The Hornets are currently second in the East and on a four game win streak. The team has gotten some good wins at the start of the season but their strength will be tested in the next few coming games. On Friday, the Hive will host the NBA’s leading scorer, Demar Derozan, and the Toronto Raptor’s in what should be a dog fight. After that they will travel to Cleveland to take on LeBron James and the defending NBA champions. The Hornets will then continue north to Minnesota, where they’ll match up against the young but dynamic Timberwolves. Thanks for reading and as always, go Hornets! Sunday afternoon the Hornets will tip off their playoff series with the Miami Heat. Charlotte is currently 0-8 in the playoffs since their expansion into the NBA in 2004. Four of those eight losses came at the hands of the Heat during their sweep of the then Bobcats in 2014. A lot has changed since that series; a new name, court, roster and atmosphere. 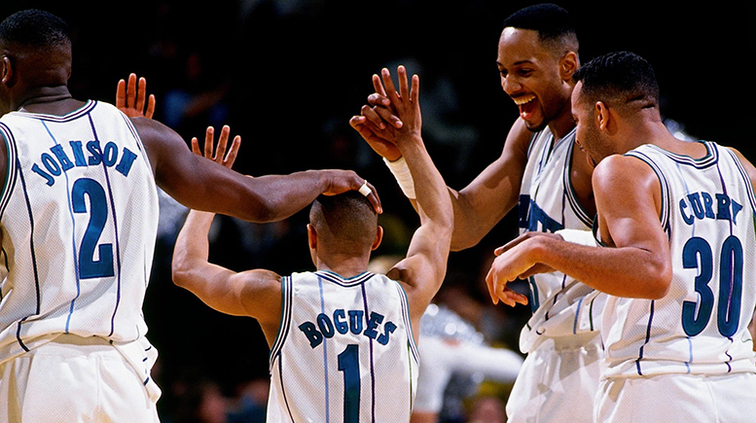 The modern Hornets are trying to continue the winning ways of the 90s’ Hornets; from 1992-2002, they made the playoffs seven times. The Heat, Hawks, Celtics, and Hornets all finished with the same record of 48-34, but due to tiebreakers, Charlotte fell to the six seed. The season series is also a draw, as each team went 2-2 against the other. In their last meeting on March 17th, Charlotte picked up an impressive win in Miami. The Heat fell 109-106 in one of the best games played by the Hornets this season. One of the biggest keys to winning this series is controlling the paint. 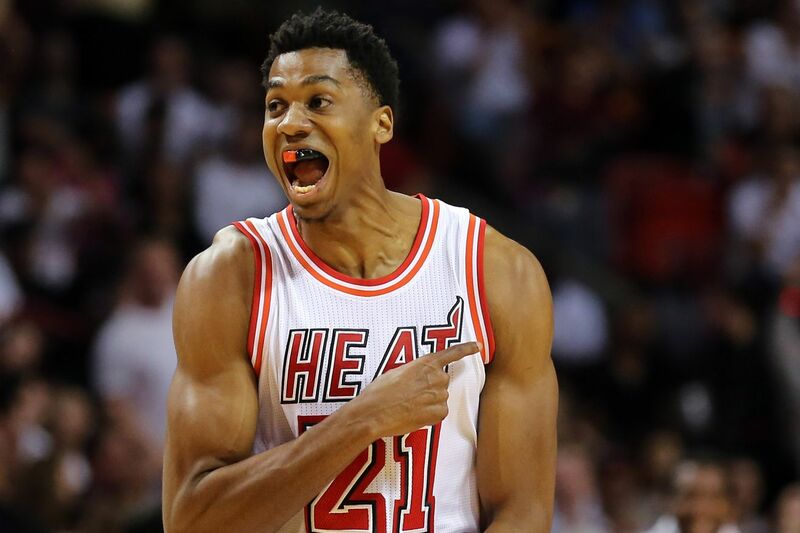 With Miami’s big man, Hassan Whiteside, roaming the low block; it will be crucial to find the right match ups. The center averages a double-double whilst adding 3.7 blocks per game, a league high. The job of guarding Whiteside will mainly belong to Cody Zeller and Al Jefferson. Although Jefferson is not known for his defensive prowess, he makes up for it in his scoring ability. The last time the Hornets met the Heat in the playoffs, one of the reasons for the sweep was Jefferson’s foot injury that he suffered in game one. After dealing with injuries again this year and missing the middle of the season, Big Al is finding his groove again; he finished with 26 in the last game of the season against the Magic. If the Hornets want to win this series, limiting the Heat’s second chance points and boxing out are crucial. Although the Hornets don’t have any All-Star names like Dwayne Wade, they do have a roster full of players that can effectively contribute to the offense. Charlotte has players off the bench that could be difference makers; one of those players is Troy Daniels, who has seen increased play as of lately. The guard hadn’t scored in double digits since January 25th when he hit eight three pointers, including the game winner against the Kings. Daniels chose the right time of the season to heat up though; he’s scored double digits in three of the teams last four games. In those games, Troy has been especially hot from three, shooting a scorching 52%. Also important off the bench is the play of Frank Kaminsky. The rookie seven footer should adapt to the playoff atmosphere smoothly after making a run to the National Championship game in last years NCAA tournament. Frank’s defense will be tested going against Miami big men such as Amar’e Stoudemire. He has struggled against the Heat so far this year, but his length and shooting ability should help to stretch the floor. Charlotte and Miami may have finished the season with identical records, but the better team will soon be determined. No matter what happens, the Hornets had a tremendous season and have great building blocks for the future. That’s what Kemba Walker had to say following the Hornet’s win over Philadelphia on April Fools’ Day. That quote summarizes more than just the 76ers game, but the entire season. There have been times this season where it has seemed as if the Hornets were completely out of a game, only to make a late push and come back. The team seems to always be in that mindset of “we can win this game,” which has led to the best season Charlotte has seen since rejoining the league. 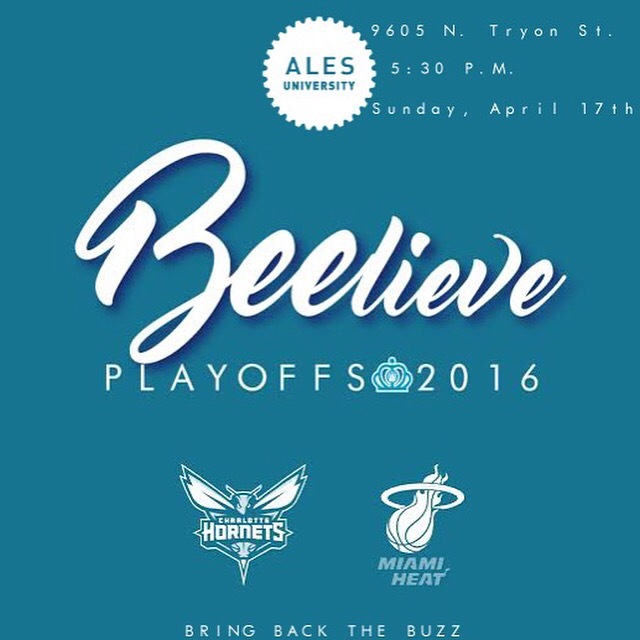 Although the Hornets have had a great regular season, the team is still looking for one thing; a playoff win. In their eleven seasons, Charlotte has only made it into the playoffs twice. In the franchises’ playoff debut in the 2010 playoffs, the Bobcats were swept by Dwight Howard’s Orlando Magic. In their second playoff appearance in 2014, the team was swept yet again, this time by Miami’s big three of Lebron James, Dwayne Wade, and Chris Bosh. So what makes this year different and how will the Hornets be able to celebrate their first playoff victory? The first thing you need to know is that the Hornets are hot. In March, the team recorded an impressive record of 13-3. Thirteen wins, a team record for W’s in a month, led to Steve Clifford winning Eastern Conference coach of the month. The highlight of the winning streak was March 21’s win over the Spurs. The Hornets came back from 23 to beat San Antonio 91-88. The comeback was the worst largest lead surrendered by the Spurs in the Tim Duncan era. Next, Charlotte has completely revamped their offense, which led them to 109.2 PPG in March, second in the East. This graphic which was featured in a fantastic SB Nation article, shows the substantial improvements Charlotte’s offense has made this year. The full article can be found here: http://www.sbnation.com/2016/3/29/11320144/charlotte-hornets-breakdown-analysis-offense-three-pointers-steve-clifford. Charlotte has clearly made great strides in their ability to shoot from last year. Marvin Williams has been one of the biggest contributors to the increase in 3’s as he is having a career year shooting the ball. William’s fantastic year puts him in elite company in Hornets history as him and Jamal Washburn are the only to record 100 threes and 500 rebounds in a season. Another reason for the Hornet’s success is that the team doesn’t have to rely on one player for production. Kemba Walker is the highest scorer for Charlotte at 21 PPG, but there are multiple players on the roster that can step up at any time to lead the team to a win. This was shown in the Spurs game where Kemba struggled shooting a mere 2-11. Jeremy Lin stepped up in his place dropping 29 points on the second best team in the NBA. One of the biggest downfalls of the 2013-2014 Bobcats whom fell to the Heat was that they mainly depended on Al Jefferson for offensive production. When Big Al was hurt with a foot injury during the playoff series, the team struggled to find ways to put up points. During the 13′ season, only five Bobcats averaged over 9 points a game; Al Jefferson, Kemba Walker, Gerald Henderson, Gary Neal, and Ramon Sessions. This year though, the scoring is more evenly spread amongst the team. Five players are averaging over 10 PPG; those of which are Kemba Walker, Nic Batum, Jeremy Lin, Al Jefferson, and Marvin Williams. It’s also important to note the production of Courtney Lee, Cody Zeller, and Jeremy Lamb whom all average nine points a game. The Hornets also have for the first time ever, a true home court advantage. When Charlotte scores over 100 points at home, chances are they’re taking home the W, as their record in these games is 22-1. The Buzz is growing around the team, during the year of their last playoff appearance, the average attendance at games was 15,234. That number has greatly grown compared to this years average of 17,466 attendees, a difference of 2,000 more fans at each home game. The team will look to finish strong in their last few games. What playoff spot Charlotte will finish with is still a great mystery due to how close the East is. At one point they had worked their way up to third, but a loss to the first place Cavaliers dropped them all the way to sixth. Right now it looks like the Hornets will most likely have to play either the Heat, Pacers, Celtics, or Hawks. Fortunately for Charlotte, there are some great opportunities to pick up some wins before the end of the season. After a tough game in Toronto on the fifth, the Hornets will face the Knicks, Nets, Wizards, and Magic. All teams that Charlotte has found success against this year. The toughest remaining game is April 11’s matchup against the Celtics in TD Gardens. Also, Happy Birthday to Frank Kaminsky, the Hornet’s big man turned 23 Monday. The Hornets head into the home stretch of the season looking to secure a playoff spot in the tight East. Charlotte is currently in the middle of the pack at the six seed. The team has been hot lately, winning eight of their last ten games. The winning streak has also included an impressive road trip where the Hornets picked up two wins in Indianapolis, along with victories in Milwaukee, Brooklyn, and Philadelphia. Charlotte missed an opportunity to climb up in rankings when they fell short against the Hawks in a game which took place on February 28 in Atlanta. The Hornets came out cold in the first quarter, scoring just nine points compared to the Hawk’s twenty five. Charlotte came storming back in the 4th, cutting the lead to just two, but their efforts fell short, and Atlanta took the game 87-76. After the loss, Charlotte quickly bounced back at home in a contest with the Phoenix Suns. The struggling Suns came into town winning only one of their last fifteen games. Luckily for the home team, Phoenix continued their losing ways, dropping the game 126-96. The entire Charlotte roster got in on the fun, as all 13 players scored on the night. Four Hornets finished in double figures including Kemba Walker, Nic Batum, Al Jefferson, and Jeremy Lamb. It was also Nickelodeon night in the Queen City, Charlotte donned Rugrat themed gear. The 90’s themed night featured a visit from Kel Mitchell, star of Kenan and Kel and Good Burger. There have been multiple contributors to the Hornet’s recent success, but lets take a look at some of the players who have stepped up as of lately. A large part of the Hornet’s success this season has been due to Kemba, as he is easily having the best season of his career. In the past three seasons he has averaged 17 points a game, this year though the PG is dropping 20 a night. Walker’s increase in scoring can be attributed to his much improved shooting, last year he shot 30% from three, while this year he is shooting 37%. Kemba has also become the go-to guy for Charlotte, someone you can count on to give you a bucket late in the game. The Hornets often find themselves in close games and Kemba has been the difference maker in a lot of them. If the Hornet’s want to make a run in the playoffs, Walker’s scoring and leadership are crucial to the teams success. Kemba has led the team in scoring in seven of the last nine games. Although he may not be putting up numbers like he did a couple years back in New York, it seems that Linsanity has found a new home in Charlotte. Lin has been very beneficial off the bench for the team and has added some much needed scoring to the second unit. In the last six games, Jeremy has finished in double figures four times. Having a solid second point guard is huge for the Hornets as it takes pressure off Kemba and it’s nice to have another guard who can score. Steve Clifford has experimented with playing both Walker & Lin at the same time, perhaps we will see more of that as the playoffs come closer. Forward Marvin Williams has been doing a little bit of everything for Charlotte this year, defense, shooting, passing, rebounding. Williams has been doing it all, quietly filling up the stat sheet for the Hornets, while adding a lot of heart and hustle. In a recent game with the Pacers, Marvin came up big with 26 points and 13 rebounds in a slim victory. It’s seems like when no one else is making shot’s, Williams can get one to fall. Looking forward, Marvin’s experience will be beneficial to the team as the playoffs approach. On Friday the fourth, the Hornets start an eight game homestead. Multiple Western Conference teams will come to town including the Timberwolves, Pelicans, Rockets, and Mavericks. The Hornet’s next game is tonight, March 4, against the Pacers. Charlotte looks to sweep the season series as they won the two previous meetings against Indianapolis. Hopefully the Hornets can continue their hot streak and finish the season strong and lock up a playoff spot. On October 3, Gilchrist suffered a separated right shoulder during a preseason game against the Orlando Magic. Doctors said that the Hornet forward would not make it back to play in the 15-16 season, but Gilchrist recovered much faster, and is back before the all-star game. In his first game back, Gilchrist had a solid debut, finishing with 13 points and 7 rebounds. Although, the Hornets didn’t have enough fire power to take down the Blazers. In Sunday nights win against the Lakers, Gilchrist displayed this new shot. Michael finished the game with 19 points, 12 rebounds, and three assist. The most impressive part of the night was that he also hit two three pointers. Two three pointers. This may not seem very significant as we are in an era where Stephen Curry averages five a game. But for Gilchrist, this is a huge stepping stone. Previously to Sunday night, Kidd-Gilchrist had played in 196 NBA games. In those 196 games, he made 3 three pointers. That’s right, three. In the matchup against the Lakers, Gilchrist nearly matched his career total in three pointers. His new and improved shot should make Hornet fans very excited. Gilchrist is already one of the best defenders in the NBA, an excellent rebounder, and extremely athletic. If you add a jump shot in there, he may be on his way to NBA stardom. After being selected second in the draft, Gilchrist hasn’t quite found his niche in the NBA. Especially in comparison to the number one pick and former Kentucky teammate, Anthony Davis. Now with a new shot, Michael may finally find his place in the league.